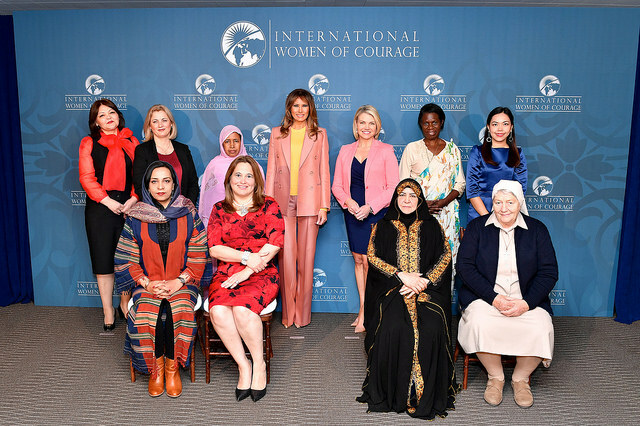 In March 2018, Meridian International Center, in partnership with the U.S. Department of State, had the honor of welcoming the Secretary of State’s International Women of Courage (IWOC) awardees to Washington. 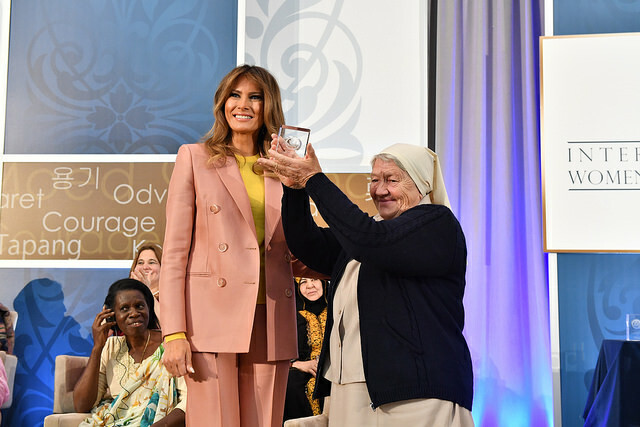 The Award was established to pay tribute to women around the world who have courageously advocated for the rights, equality, and social progress of all citizens despite the adversity and dangers they often face. This annual award was created in 2007 by Secretary of State Condoleezza Rice to mark International Women’s Day on March 8th. The 2018 Award ceremony was led by Acting Under Secretary of State Heather Nauert. 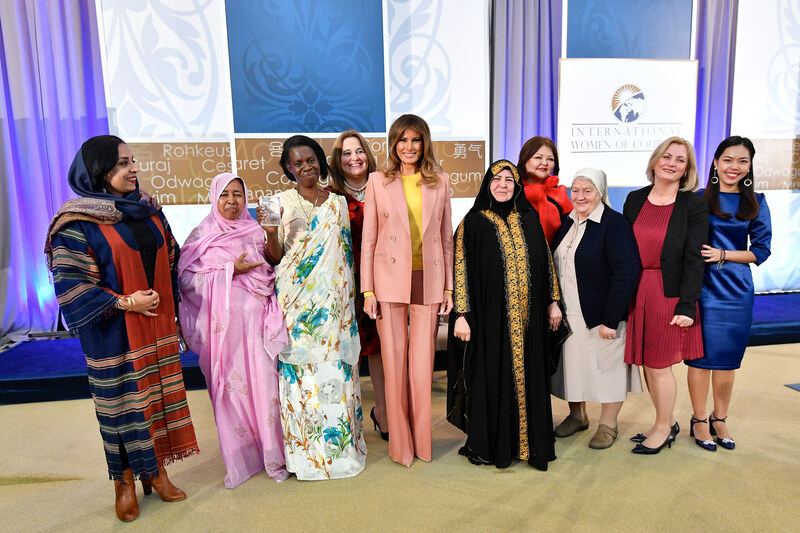 On Sunday, March 18 and Monday, March 19 representatives from Meridian and the State Department delivered an official program welcome and provided an overview of the International Women of Courage initiative. The Awardees were then able to formally introduce themselves to one another under the guidance of Ms. Emily Brown, a Policy Advisor in the Secretary's Office of Global Women's Issues. After the formal introductions, Deputy Assistant Secretary of the Bureau of Educational and Cultural Affairs Ambassador Jennifer Galt greeted everyone on Meridian's campus and sat down with them for a hosted lunch. Sirika Charoensiri of Thailand, Lawyer and Co-Founder, "Thai Lawyers for Human Rights". In partnership with the State Department's Bureau of Public Affairs and 2e Communications, a public affairs and communications firm, Meridian conducted media training workshops following lunch to prepare the IWOC awardees for interviews and media coverage worldwide. On Tuesday, Meridian organized a federalism briefing with Mr. Akram Elias, President and CEO of Capital Communications Group, Inc., where the participants were given an overview of the U.S. system of government. Afterwards the Awardees had the opportunity to take part in a private tour of the White House and rehearse for the Award's presentation that had been rescheduled from Wednesday to Friday due to weather conditions. Given the snow, the following day provided extra time for preparation for the events taking place on both Thursday and Friday. On Thursday, the Awardees were split into two groups for separate professional meetings. One toured the U.S. Capitol and met with Ms. Cathy McMorris Rogers, Congresswoman representing Washington state's 5th Congressional District, while the other met with representatives at the Supreme Court Building. That afternoon, the Awardees rejoined for a panel discussion at the U.S. Institute of Peace, where Ms. Roya Sadat, Ms. Sirikan Charoensiri, and Ms. L'Malouma Said shared their experiences in their respective nations and discussed challenges ahead before answering a series of questions along with their colleagues. They also answered questions along with their fellow honorees who were also in attendance. The IWOC Award Ceremony took place the following day in the State Department's Dean Acheson Auditorium in the Harry S Truman Building. 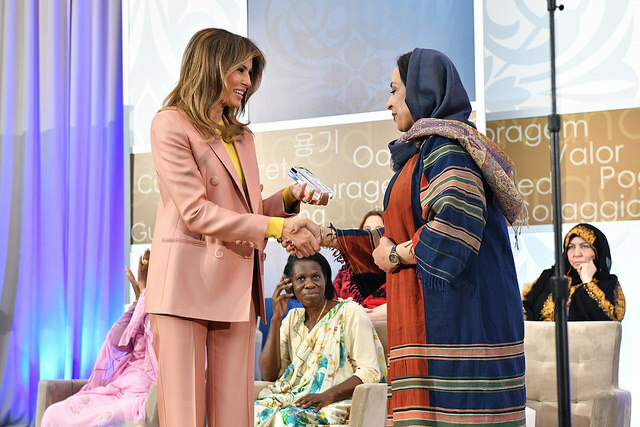 Acting Under Secretary of State Heather Nauert, was joined by the First Lady of the United States Melania Trump in congratulating and honoring each of the women. At the conclusion of the ceremony, the women took part in press interviews to talk about their experiences and their path forward. On Saturday, each of the Honorees traveled to eight cities for their individual programs in Austin, TX; Dallas, TX; Pensacola, FL; Phoenix, AZ; Raleigh, NC; Salt Lake City, UT; and San Antonio, TX. They then reconvened in Los Angeles, CA for several days of programming and an official closing to their IVLP.